Processor history. There have been many advances made by companies over the years but none as profound as Intel. This page concentrates mostly on the Intel processor and advancements. There are references to other companies as well. The processor history, starts in 1971 when Intel produced the first microprocessor called the Intel 4004. It was a 4 bit processor running at 750 kHz. Compared to today's CPU speeds, 750 kHz sounds very slow and yet they managed to do 90,000 operations per second. At the time that was fast. 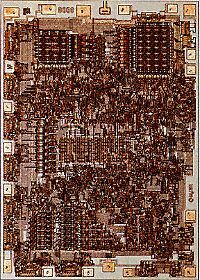 Soon after the 4004 Intel introduced the Intel 8008 microprocessor in 1972. It was a eight bit processor and ran at between 500 and 800 kHz. Not much faster than the 4004 but what made this processor good was the fact that it could process 8 bits at a time. That means double the data at the same speed. This is all well and dandy but for us, the figures doesn't mean much. Where can you use it. So Intel created the first industry standard processor called the Intel 8080 in 1974. It broke the kHz barrier by running at 2MHz and was used in the first commercially available PC, the Altair. The processor history continues with the 8085, 8086 and 8088. As you can see Intel really made an effort to stay in front. That's probably why they are still in business today and producing good processors. After the Intel 8088 came the 80286 and I still remember the day I bought my first PC with the 80286 processor. I still have the motherboard for sentimental reasons. It was referred to as the Intel 286 and ran at 12 MHz clock speed. This was also the first processor that was backwards compatible, meaning that programs that ran on previous versions could run on this processor. The Intel 80x86 series really got the whole PC market going and was eventually replaced by the Pentium series of processors in 1993. Intel wanted to call the chip the Intel 80586 but a US court ruled that you cannot trademark a number, so they called it the Pentium which is the Greek word for 5. Five because this was the fifth generation of the Intel 80x86 series of processors. The Pentium series of processors was also the first to break the MHz barrier to run at over 1 GHz. In 2006 Intel introduced the dual core processor which is used till today although their new i-series (i3, i5 and i7), has replaced the dual core series. You will see more and more of the i-series in the future. Dual core means that instead of a single CPU or core, Intel build 2 CPU or cores onto one chip. The cores will shares some of resources like L2 cache and memory, but each core has it's own L1 cache. Don't worry about the terminology at this time, it's all explained later on this site. Just follow the white rabbit. Other companies like Sun Microsystems, now bought by Oracle, also produced some of the best processors called the SUN SPARC series of processors, but these were mostly used in business and server environments. Even today, SUN Microsystems is regarded as one of the best platforms to run your database on. Sun Microsystems with Fujitsu also introduced a processor called the coolthreads processors that's capable of running up to eight cores on a single chip and eight threads per core, with more on the way. Companies like AMD and IBM also produce excellent processors which are just as widely used as the Intel series of processors. Where will it end? Good question. Who knows. Maybe one day our brains will be integrated into an 32 core CPU running at 10Ghz.